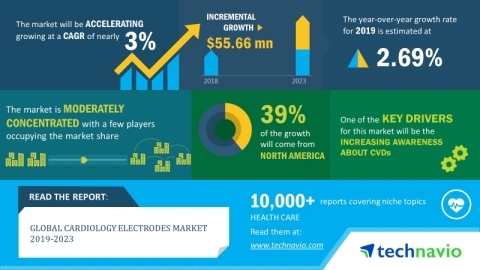 Technavio has announced the release of their research report on the Global Cardiology Electrodes Market for the forecast period 2019-2023. This cardiology electrodes market analysis report segments the market by product (resting ECG electrodes, short-term monitoring ECG electrodes, long-term monitoring ECG electrodes, stress test ECG electrodes, and neonatal ECG electrodes) and geography (Asia, Europe, North America, and ROW). Global cardiology electrodes market size will grow by USD 55.66 million during 2019-2023, at a CAGR of almost 3%. There is a huge shift from reusable medical electrodes to disposable electrodes to prevent the risk of hospital-acquired infections (HAls) and minimize the probability of cross-contamination. Also, the cost associated with the use of reusable medical electrodes is high. The chemical elements present in the gels of electrodes may cause adverse allergic reactions. This can be prevented with the growing use of disposable electrodes. The adoption of disposable medical electrodes will continue to increase as they are cost-effective and flexible. Many public and private organizations and vendors are making efforts to create awareness about heart diseases and their early diagnosis. They are also focusing on reducing the mortality and morbidity caused by sudden cardiac arrest (SCA). This is encouraging people to take personal responsibility and approach healthcare facilities to get diagnosed. Consequently, this will boost the demand and adoption of cardiology electrodes in these healthcare units. “The recommendations to use prolonged ECG monitoring techniques for the management of patients with palpitations, syncope, and atrial fibrillation will drive cardiology electrodes market growth in Europe. Additionally, the increasing healthcare expenditure in the EU and growing demand for ECG will also drive the growth of the market in Europe,” says an analyst at Technavio. Vendors are investing in technological advances to come up with sensors that allow recording of electrical impulses from the heart in the absence of conventional ECG machines. They are offering wearable technologies to be used at out-of-hospital settings such as households and public places to monitor and record cardiac impulses. Also, they are incorporating electrodes into a wireless case to develop wireless medical devices, which can transmit ECG rhythms to a smartphone. Such developments will lead to the growth of the global cardiology electrodes market. More From BioPortfolio on "Global Cardiology Electrodes Market Will Grow at a CAGR of Almost 3% during 2019-2023 | Technavio"